Sharon Smith is a descendant of the Wiradjuri tribe of western New South Wales. An emerging artist, Sharon’s paintings reflect her love of the natural world. Through her depictions of landscapes, trees and animals, Sharon explores her own personal connection with, and her people’s age-old relationship to, the earth. Sharon’s paintings thematically express her heritage and culture and work as an affirmation of her identity. Sharon has been a Boomalli member since 2010. Sharon was born in Erskineville, Sydney in 1957, the fourth of Eleanor and Matthew James Smith’s five children. As a child, Sharon was always very close to her extended Indigenous family. Sharon's grandparents lived with her and her father in their family house in Erskineville, which was usually full of relatives. Although she now resides in nearby Waterloo, Sharon spent most of her life in Erskineville and describes the suburb as being a very special place for her family. Her childhood was a happy one. For Sharon and her siblings, there was no distinction between ‘black’ and ‘white’. While this was a positive aspect of her early years, her father was always very reticent to talk about the past and, although her grandmother told her stories, Sharon only remembers a few of them. At the age of 18, Sharon gave birth to her daughter, Simone. Being a single mother has been the defining feature of Sharon’s life. With the help of her father and grandmother, Sharon threw all her energies into Simone’s upbringing and mother and daughter have always remained extremely close. Sharon found herself in need of a hobby and first took up art in 2009, attending classes at Eora TAFE College for Aboriginal and Torres strait islander as soon as she picked up a brush, she felt that everything had fallen into place. Art was not just a hobby – it was a means of uncovering her personal and cultural identity. For Sharon, Eora College was to be far more than a mere educational institution. In its family-oriented, laid-back atmosphere, she met Aunties and Uncles who knew her people and their origins. Inspired by her teacher, Sharon attained both Certificates IIIand IV in Aboriginal and Torres Strait Islander Cultural Arts and has participated in many exhibitions there. Along with her exhibitions at Eora, Sharon began exhibiting with Boomalli in 2010 in the “Amnesty Impressions” exhibition. 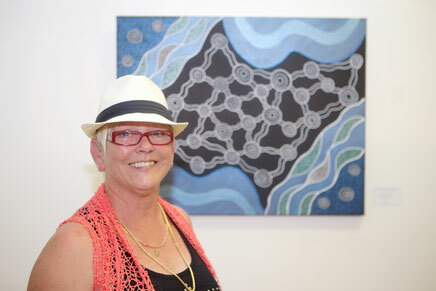 She became a member of the Boomalli Aboriginal Artists Cooperative and a regular volunteer. In 2012 she exhibited in “The Graduates”, at The Limelight Gallery NSW and Kerrie Lowes Gallery NSW. Sharon continues to exhibit regularly at Boomalli. Sharon was a finalist in the Parliament House awards 2014 and a finalist in the Fishers Ghost awards 2015. As well as being a means of connecting with the wider society, Sharon’s art has also played a major role in her personal journey towards gaining understanding and insight into where she comes from.